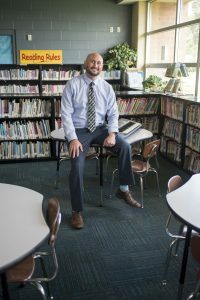 Having completed his first year as an elementary school principal, Brandon Kulka is ready to welcome the new and returning students this fall. Last year, he made a point of building solid relationships. This included greeting the learners as they walked into the school building each day and spending time getting to know their parents. Encouraged by fourth grade students to participate in a Pizza Hut “Book It” Reading Program for principals, he spent an entire day reading to different classes while wearing costumes of the book characters including dressing as A Cat in the Hat. “Reading to students is one of my favorite things to do. I try to read in classes as often as possible,” he says. Brandon credits the school’s team for helping to make his first year successful. “Holy Trinity has an amazing staff and teachers. They are excellent at their jobs and were of great assistance to me,” he says. As principal, Brandon’s typical day often starts with wishing the students a good morning, connecting with the administrative assistant and his Dean of Students, placing phone calls to the diocese or the state when appropriate, assisting in the cafeteria, working with teachers and managing enrollment. He particularly enjoys stopping in a classroom to say hello and see the students grasping new concepts and lessons. Falling back on his Catholic upbringing, he occasionally will visit the school’s outdoor shrine to say a Rosary. Towards the end of the school year, he even dedicated time each morning for a rosary walk to assist with enrollment. “While everything is looking good with no worries, every little bit helps,” he says with a smile.